Venezuela is edging closer every day to its breaking point. 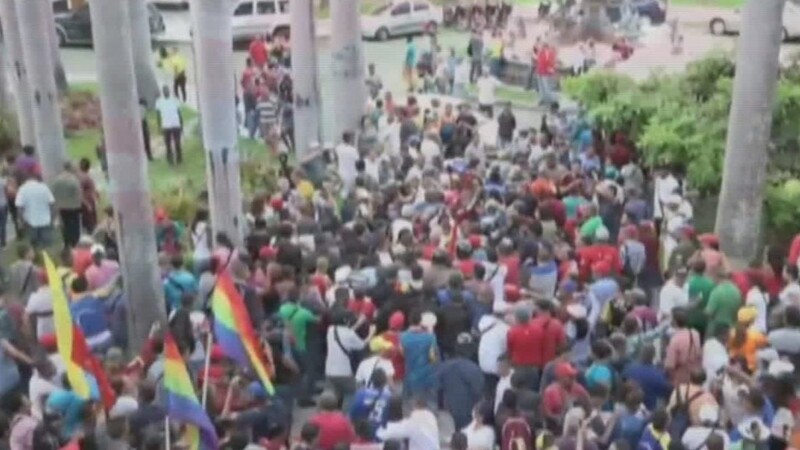 A massive nationwide protest against President Nicolas Maduro is expected Wednesday. His critics are declaring that Venezuela's democracy is nearing collapse after Maduro quashed a referendum vote seeking to remove him from office. "Only dictatorships deprive their citizens of rights," Luis Almagro, secretary general of the Organization of American States, said Saturday. "Today we are more convinced than ever of the breakdown of the democratic system." Maduro's supporters on Sunday attempted to storm the National Assembly, which is controlled by the opposition party. Lawmakers from the opposition responded Tuesday by calling on Maduro to testify before them to determine whether he should be removed from office. All this is happening in a year when its citizens have battled with food and medicine shortages, sky high inflation and dwindling options. How did it get so desperate in Venezuela -- a country sitting on more oil than any other in the world? Here are 4 reasons why it's diving deeper into crisis mode. 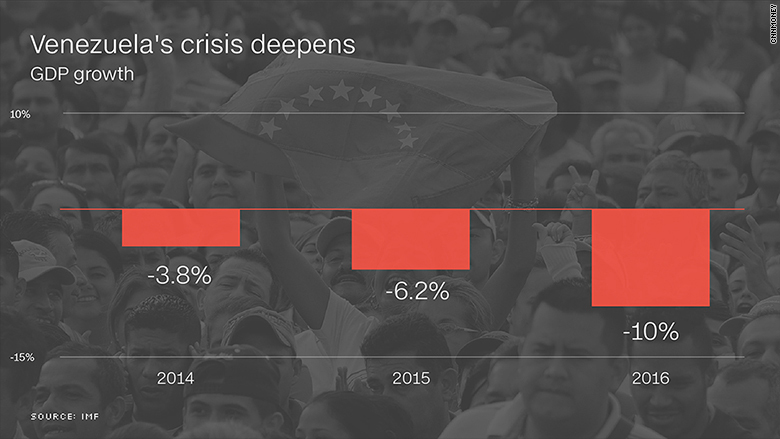 Venezuela is in its third year of recession. Its economy is expected to contract 10% this year, according to the International Monetary Fund. The IMF forecasts Venezuela will be in recession until at least 2019. While the economy shrinks, the price of goods is skyrocketing. This year, inflation is expected to rise 475%, according to the IMF. Venezuela's currency has plummeted in value. Consider this: one dollar equaled 100 bolivars exactly two years ago. Today, a dollar gets you 1,262 bolivars, according to DolarToday.com, which tracks the popular, unofficial rate. Things got really bad when oil prices started to plunge in 2014. Venezuela has the world's largest oil reserves, but the problem is that oil is the only game in town. It makes up over 95% of Venezuela's revenue from its exports. If it doesn't sell oil, the country doesn't have money to spend. Oil prices were over $100 a barrel in 2014. Today, they hover around $50 a barrel, after dropping as low as $26 earlier this year. The problem is that Venezuela has not taken care of its cash cow -- squandering opportunities to invest in its oilfields when times were good. Because the country has neglected with the upkeep of its oil facilities, production has dropped to a 13-year low. Venezuela's state-run oil company, PDVSA, hasn't paid the companies that help extract its oil, such as Schlumberger (SLB). In the spring, Schlumberger and other companies dramatically reduced operations with PDVSA, citing unpaid bills. PDVSA warned last week that it could default on its debt if bondholders didn't accept new payment terms. On Monday, just enough investors accepted a new deal that will allow PDVSA to likely avoid default this year. However, experts say it's only delayed a default by a few months. Venezuela's food shortages became extremely severe this year. Venezuelans went weeks, in some cases months, without basics like milk, eggs, flour, soap and toilet paper. Despite a crashing currency and falling oil revenue, the government continued enforcing strict price controls on goods sold in the supermarkets. It forced food importers to stop bringing in virtually everything because they would have had to sell it for a major loss. In the first half of 2016, food imports were down by nearly 50% from the same time a year ago, according to several estimates. Only recently has the government stopped enforcing price controls, and food has returned to supermarket shelves. However, prices are so high that few Venezuelans can afford the food. Medicine remains in short supply too. Venezuelans hunt for penicillin and other remedies at pharmacies everywhere, often without any success. The country's public hospitals have fallen apart, causing people, even infants, to die due to the scarcity of basic medical care. Venezuela is running out of cash quickly. It doesn't have enough money to pay its bills for too long. The math just doesn't add up: It owes $15 billion between now and the end of 2017, while the nation's central bank only has $11.8 billion in reserves. At the same time, Venezuela's only other cash source, PDVSA, is pumping less oil and risking default. Most of its reserves are in the form of gold. So, to make debt payments this year, Venezuela has shipped gold bars to Switzerland. China used to bail out Venezuela and loan it billions of dollars. But even China has stopped giving its Latin American ally more cash. Wednesday's protests are a stark reminder that Venezuela is running out of time, money and options very quickly. "Tempers are getting hot in Venezuela," says Eric Farnsworth, vice president at Council of the Americas. "All the indicators are that the situation is deteriorating fast and it's not going to get better anytime soon."